The winter finale of Nashville left viewers with quite the cliffhanger. One character is killed off, but we don’t know exactly who dies. In previews for Episode 11, we discover that Will Lexington, seemingly on top of the world, is actually filled with turmoil. In the preview for episode 11, we find Lexington stepping in front of an oncoming train. But Lexington is not the only possibility. During last night’s (Dec. 11) episode, Rayna Jaymes speaks with Teddy Conrad, while his new wife Peggy is nearby. As the surprisingly pleasant conversation ends and Teddy walks away, a stranger approaches and attempts a hit on Nashville’s Mayor Conrad. As Teddy attempts to wrestle the gun from him, the gun fires, hitting Peggy. The scene ends with Peggy lying, seemingly lifeless, on the ground. Previews of Season 2, Episode 11 seem to indicate that it is Peggy who is killed, but it is not certain. Juliette Barnes is the face of Teddy Conrad’s new music festival, but the press is more concerned with allegations that she caused the breakup of Charles and Olivia Wentworth. During her headlining performance at the festival, someone holds up a large sign bearing the label “Homewrecker.” Humiliated, Juliette fumbles her performance, until guitarist Avery Barkley steps in to sing with her. He later meets to comfort and give his friend some advice on the situation. Juliette seems convinced that it is newcomer and opening act Layla who leaked the information to the the press, so she confronts the talent show winner. Layla has a catty way of denying that she leaked the information, which only further infuriates Juliette. After Deacon finds out his name has been removed from the music festival’s list of performers, he teams with Gunnar Scott for their own performance. Gunnar gave his potential hit song to Edgehill Records for Will Lexington to record; in return, Edgehill’s CEO promised him a prime performance slot at the festival and the appearance of several music industry execs. That prime performance opportunity turns out to be a makeshift stage near the portable restrooms. Gunnar and Deacon decide they can do better and pull some strings to get their own performance off festival grounds. Teddy attempts to shut down Deacon’s parking lot party, and is told there is nothing he can do, as the owner of the property gave Deacon permission. 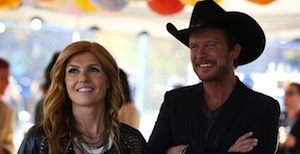 Parenting conflicts arise earlier in the episode, pre-hitman shooting, when Peggy refuses Maddie’s request to watch her father Deacon perform; the musically talented teen ignores Peggy and makes the same request of Rayna. The characters come together mid-episode at the parking lot performance to watch Deacon and Gunnar perform for a considerable crowd of admirers. After Deacon finally gets his moment in the spotlight as a solo act, another music industry exec later asks him about putting out a solo album. Rayna’s not backing down on setting up her Highway 65 label. Edgehill’s CEO Jeff Fordham tries to persuade Rayna not to leave the label by presenting her with “research” that he has obtained. Rayna doesn’t believe his research and realizes that Jeff and Rayna’s semi-boyfriend Luke Wheeler seem very chummy. She discusses business options with sister Tandy, and later, Rayna mortgages her house and borrows funds from her sister to make the $20 million Edgehill requires to buy out her contract. Superstar Luke unsuccessfully tries to convince her not to break ties with Edgehill. As soon as he learns Rayna’s deal with Edgehill has cooled, he cools the superstar couple’s relationship. He says he’s sorry they won’t be promoting the new single together. It seems easygoing Luke was using Rayna for his own business means. Scarlett O’Connor is still reeling from the news that Zoey and Gunnar are an item. Her disappointment doesn’t sit well with Avery, who thinks Scarlett still has feelings for Gunnar. “You are the only one who has ever been honest with me,” Scarlett tells Avery, explaining that she’s only disappointed that Zoey and Gunnar’s relationship began in secret. Later in the episode, Juliette and Charles seemingly breakup for good. Charles says he hopes Juliette can find the person who makes her the best version of herself. After the conversation, Juliette thinks of friend Avery and decides to see if she can make the friendship blossom into something more. Unfortunately, her timing is off; she shows up at Avery’s door, only to see him with Scarlett. In the promo for episode 11, Kelly Clarkson makes an appearance as herself, and we find out which character dies–Peggy or Will. Watch the promo for Season 2, Episode 11. The episode airs Wednesday, Jan. 15.